Setting up a power pole is not as easy as you would imagine, even if you have the heavy equipment to put it into place. You must have a hole that is deep enough that can contain enough of the pole to provide it with adequate stability. In that hole, you are going to add concrete to keep it in place, and it must be perfectly aligned, requiring you to use a level. Finally, you will need to connect the electrical apparatus that you will use to connect power lines that will allow you to deliver electricity to places miles away. How Deep Should The Hole Be? The depth of a power pole hole needs to be 10% of the total length. You should also add two additional feet for maximum stability. As an example, if you have a utility pole that is of standard length which is 40 feet, the whole is going to be 4 feet in depth, plus an additional 2 feet, for it to be properly secured. This is how every power pole that you see is position, and by using this ratio, you won't have to worry about any of them being compromised by high winds or snow. How Long Should The Concrete Cure? 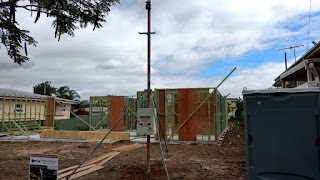 Most of the power poles at www.polesandholes.com.au that are put into position must be braced while the concrete is allowed to cure. It is recommended that it cure for at least 24 hours, but some will be longer. It depends upon the size of the hole, the power pole, and how deep the hole was. It also depends on the consistency of the concrete, how much aggregate material was used, and the type of Portland cement used in the mixture. By considering all of these variables, and having the proper heavy equipment to get it into place, you can easily set these up by the dozens on a daily basis.